We all know that eating animal products is bad for the animals, bad for the environment and bad for your health. But are you aware that it's also bad for your bank balance? One reason that so many people get a large proportion of their daily requirement from plants is because it is not only a cheap source of protein, but it also supplies other nutrients too, which makes eating a balanced diet easier. Difficulties associated with a vegan diet are that you have to mix your sources of proteins to make sure that you get all the essential amino acids. You also have to take care to include a source of vitamin B12 which could mean taking a supplement or eating/drinking products fortified with B12. Getting an adequate supply of calcium and omega-3 fatty acids is also something to be aware of. For someone who eats animal products, the biggest issues are likely to be an excess of saturated fats and calories. These can lead to health issues such as diabetes, cancer, cardiovascular disease, strokes and obesity. This seems to be reflected in the medical research which suggests that vegetarians and vegans have fewer health problems than people who eat animal products. But let's get back to the cost... We don't just need proteins as our gross nutrional requirement, we also need fats and carbohydrates, as well as fibre. However, we also have to be sure that we don't eat too much salt or saturated fats. I had a look on the website of a supermarket in the UK to try to find the cheapest vegan and animal based sources of protein. I then calculated how much it would cost to get a day's protein requirement. Oats were also quite cheap: 1 kg of own brand value oats cost 75p http://www.tesco.com/groceries/product/details/?id=259458142 It contains 11 grams of protein per hundred grams so you would require about 450 grams to fulfil your daily requirement: that's going to cost about 34 pence. It does come with a lot of fibre and very little salt and saturated fat. The cheapest meat based product that I could find was the supermarket's "value" brand pork sausages £1.09 for a kilo.http://www.tesco.com/groceries/product/details/?id=280555822 With a protein content of 14.2 grams per hundred grams, a day's protein requirement would require about 360 grams costing about 39 pence. However this is also accompanied by about 5 grams of salt and over 10 grams of saturated fat and only a small amount of fibre. If you compare the plant products to the cheapest meat product, it's clear that not only do they provide a cheaper source of protein, but they also provide more calories. This means that it would be possible to fulfil a person's total dietary requirements a lot cheaper using these as a base than using meat. I'm not advocating that you live on pasta or oats as a vegan diet doesn't have to be and shouldn't be boring. 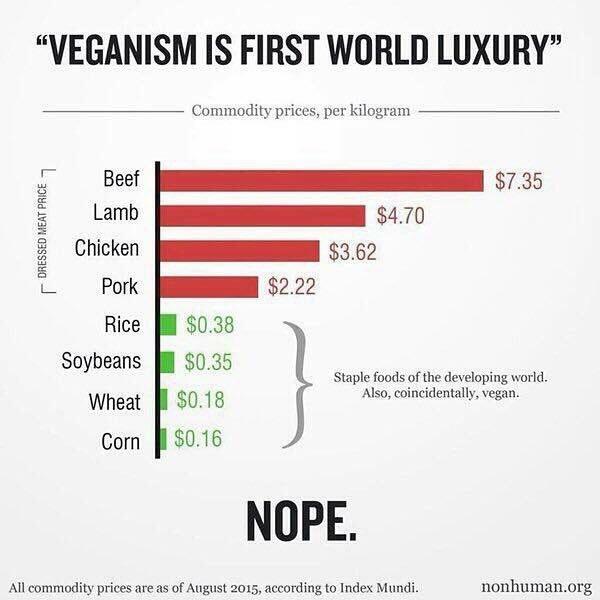 However, if someone complains that a vegan diet is a fad for rich people, you can show them just how wrong they are.